As usual, I get involved in things. Although I am still revising my own B2ME items so that I can post them at my archives, and still doing beta work for Lai, I am also trying to brew potions and cast spells in Pottermore. I am reading through the seven Harry Potter novels on my NookColor right now, and am reading the two remaining books in my "dialect can carry a story" recommendations. In other words, I'm busy (good). I was sorted into Ravenclaw. I'm actually rather pleased by that. I think what I like most about the silly games on Pottermore is that they are silly, therefore not life-threatening, not leaving bodies in my wake, and requiring a bit of skill and practice. I suppose it's just as well that my laptop computer's graphics card can't keep up with the graphics or else I'd play it at work too. As it is, I play it at home and that's bad enough. Oh well, I know this will be temporary and that my mind is just giving me a small break while I continue thinking about plot development, characterizations, and historical frameworks. The pic of Diagon Alley is larger than I would usually post, but it's such a great scene. Click on the pic to see it clearly resolved. A week from now I'll be on the highway driving down to Lincoln, NE to meet my cousin for a quick visit. I'm starting to get excited, and I'm trying really hard to avoid unreasonable expectations. We last met face-to-face when her daughter was still quite young, probably no more than ten years old. Her daughter has graduated from college and got married last summer. My cousin and I grew up across the street from each other. She was my little sister, my friend and companion in escapades, and we were together almost every day for years and years. It seems so strange that it has been so long. So I'm really looking forward to having her close to me for two days and three nights. It'll be like a dream come true in so many ways. 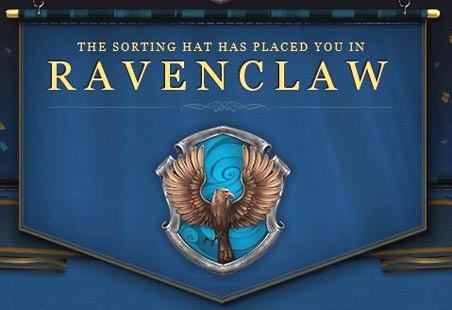 I actually wanted Slytherin, but I guess I picked too intellectually and ended up in Ravenclaw. It was a long time sorting me though, so I may have been on the fence - LOL.